Dec 7-Jan 25 Afa Gallery Member Show, 524 Lackawanna Ave, Scranton PA. Opening reception Fri, Dec 7, 6-9 pm; regular hours Thursday through Saturday, noon to 5. Ongoing: Bowls and More at B’s Floral Design, 131 Penn Ave, Scranton PA 18503. Nov 24 (10:00-5:00) & 25 (10-3), 2018, Pocono Mountain Arts Council‘s Holiday Arts Festival at Skytop Lodge, Skytop PA.
May 2-June 24 “Influences and Inspirations” PMAC member show at Barrett-Paradise Friendly Library, Cresco PA. Awards reception on June 24, 6-9pm. February 8 to May 26 “Living the Good Green Life,” Dunning Gallery, Keystone Hall, Northampton Community College Monroe Campus. Six regional arts groups juried their own artists for entries into this show. Our triptych, “Summer Trees, Days Gone By,” was chosen by the Pocono Mountain Arts Council. 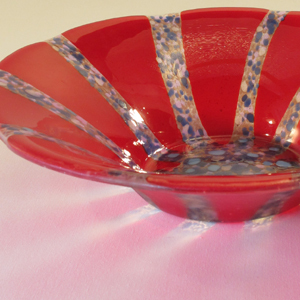 Ongoing at B’s Floral Design, Scranton PA. Now showing “Red is for lovers” fused glass. February 1 to March 31, “Mirror, Mirror, On the Wall” exhibition of our free-form border mirrors at the Logan Steele Community Center, Lake Naomi Club, Pocono Pines PA, together with paintings by Maria Ferris. Saturday, July 11 (9:30-4:00) Festival of the Arts, Chateau Resort, Camelback Mountain (Tannersville PA). June 22 – August 14th Pocono Arts Collage, Northamton Community College Monroe Campus, Keystone Hall, Dunning Gallery. Six regional arts groups came together for a show on this new “green” campus. Jay and I were both chosen to represent the Pocono Mountain Arts Council. Ongoing at B’s Floral Design, Scranton PA. Now showing fused glass with an air of spring. Saturday May 9 (10-5) & Sunday May 10 (10-4:30) American Artisan Showcase at Byers’ Choice Bucks County Workshop, Chalfont PA, a beautiful location where we’ll be among other fabulous work. Contact us for a discount admission card. Saturday, December 6 through Sunday, December 21, showing fused glass dishes and stained glass panels during Holly Days at the EMCA Gallery, Tunkhannock PA. Opening weekend coincides with Tunkhannock’s Christmas in Our Hometown; Saturday & Sunday hours are 10 am to 5 pm. Regular hours are 1:00-5:00 on Friday, Saturday, & Sunday; 1:00-3:00 on Monday through Thursday. Call ahead (570.836.3622) to confirm or make other arrangements. Friday, May 2–Saturday, May 24 Afa Member Show at the Afa Gallery, 514 Lackawanna Avenue, Scranton PA; gallery hours Thur/Fri/Sat noon to 5 pm. Wow that bowl is beautiful!! My apologies, Michael, as I just discovered that your question went unanswered. You saw an 11″ diameter bowl on our Paulukonis Studio website and asked the price. That size bowl sells for $100. While that particular bowl is no longer available, we can make a similar one.